Do you have a collection of watches and or expensive cuff links that you wear often to work or social places? 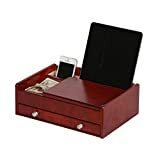 Instead of laying them aimlessly on your nightstand or using the traditional storage boxes that individuals have relied on for years, do the justice by purchasing a Morelle Kennedy jewellery box from Amazon or any other reputable store of your liking. Made of premium leather, it is stylish and designed to blend well with most types of furniture. Its lightweight design is portable while the four cuff-link compartments, two cushioned watch holders, cell phone compartment, and the separate ring compartment offered secure personal effects well. With an original box, you also get attractive stitching details that enhance its charm and a snap closure system that secures its lid well in storage or in transit. Featuring an aesthetic leather (brown) construction and a lockable drawer-like design that accommodates up to 12 watches, SONGMICS is a novel display box/organizer for jewellery that scores high in several regards. Its top-notch design (faux leather with beige velvet lining), for instance, is not only eye-catching but also protects valuables from scratches and damages in storage. The multi-functional storage system offered, on the other hand, accommodates a myriad of accessories (watches, ear studs, rings, necklaces, and cuff links, for instance), while its large glass lid is perfect for showcasing your personal collections while protecting them from dirt and other environmental elements at the same time. Manufactured using solid Burlwood, Davin from Mele & Co. is an aesthetic and durable dresser valet with a masculine deep finish (walnut) that most men appreciate. Lightweight and with a portable medium-sized body, it is an excellent travel accessory. The covered storage compartment offered is large, sectioned (for categorizing personals), and has an integrated coin slide for catching keys and change. It also has a single side drawer for storing watches, credit cards, and other similar accessories and two open compartments for storing mobile devices, bills, and even day planner. Mele & Co. offers a 100% money back guarantee for each Davin bought. This watch box from pearl is an aesthetic glossy back accessory made of durable crocodile leather. Designed to fit up to 10 large watched without scratching, it is spacious, super flexible, and handles both storage and transportation jobs excellently. Apart from watches, you can also use it to store rings, cuff links, earrings, bracelets, and sunglasses without compromising their value over time. Are you tired of scratching your watches during storing? Have you lost several premium cuff links due to poor storage options? To solve the foregoing problems on a budget, Autoark AW-001 is a valuable watch and jewellery box to consider. Made of quality leather (black), it is stylish, durable, and designed to blend well into all types of homes without cluttering space. The lockable drawer offered improves safety while its spacious design and well-finished inner has made it a sought-after jewellery box by men of all cadres. With one, therefore, you will be able to store up to 12 watches without damage. 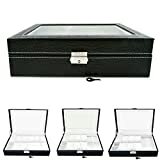 Its clear glass top eases location of your desired watch at a glance while its suitability for storing bracelets, earrings, necklaces, and rings makes it an ideal all-in-one storage solution for men. For those shopping for a smaller and portable jewellery box that they can carry around effortlessly during their many trips, SONGMICS UJWB11B is an ideal model. Made of black leather, it is lightweight, durable, and has a charming allure that makes it an ideal accent piece in homes. The built-in organizer buyers get accommodates up to six watches comfortably, while its built-in mirror and lockable cover offered enhance its versatility and safety respectively. 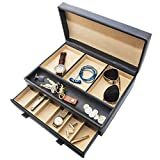 A most SONGMICS products, you also get top-notch crafting and storage spaces for earrings (two belts), bracelets, cuff links, and even glasses. 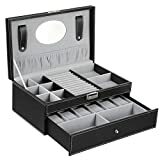 With this Dresser Top Valet/Jewellery Organiser from Stock Your Home, you get a professional-grade storage accessory with 10 compartments that accommodate numerous types of accessories. Whether you have watches, necklaces, and or earrings, for instance, the organiser compartment offered not only secures them well but also eliminates the need for messy drawers. Safety is impressive, while the charming faux leather used to manufacture it improves its aesthetic value significantly. Stock Your Home Dresser measures approximately 12-3/4 x 9.375 x 4.125-inches and is attainable cheap on Amazon and other reputable stores. As most SONGMICS jewellery boxes listed, this UJWB012 model is a top of the line display case and drawer with a lock for safety. It is affordable, has a spacious and well-crafted interior that accommodates up to 12 watches, and has a premium faux leather construction that is both aesthetic and long lasting. Unlike wood and other common materials, you do not have to worry about it fading and or losing its charming appeal over time. You also get five additional compartments for bracelets, necklaces, and other jewellery and a large glass lid that protects valuables from dust and other elements while optimising view at the same time. 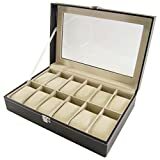 Ranked among the best products in top 10 men jewellery boxes reviews 2016, this Generic watch box is a charming wooden jewellery case organiser that contains up to six watches at a time. The black PU leather used to line its interior is soft and durable. The display glass top offered adds style and function while the array of storage compartments offered are not only large but also ease organisation of and access to valuables. Featuring an aesthetic vintage theme and a spacious 12-watch compartment with padding for optimal safety, Best Choice Products Watch Box/Case Organizer scores high among the best products in this niche mainly because of its charm and functionality. Forget about the plastic container or the cardboard box that you have used for years. With one, you will be able to secure your units well and protect them from scratches over time. Its fitting lid has a lock and clear glass for safety and elegance respectively, while its fully lined interior (grey velvet) dampens shock well when dropped accidentally.